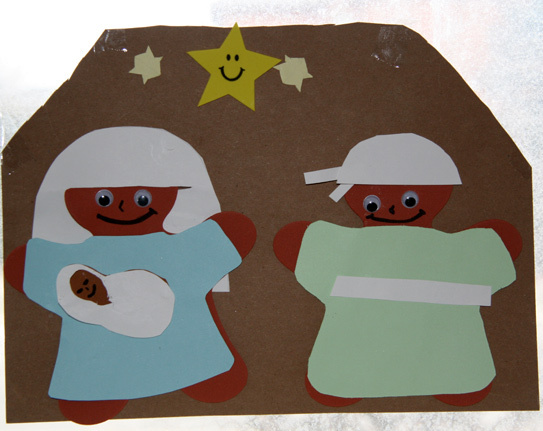 Great Nativity Craft for Kidz! a. Either get your child to colour them in or you can cut them out as use them as stencils to cut out coloured or construction paper. On Saturday we went to a Christmas party for the kids of our parish. It was lovely at the end they asked the kids to write their daily commitment/gift they would do for Jesus. My daughter whom is 5 decided she’d like to decade of the rosary a day. So each day once she has done this craft or offered another little gift for Jesus (i.e. eating the dinner she didn’t like) –she glues a little star and adds it to the sky over the nativity to make a bright beautiful sky for Christ’s birth! I cut theses sets out in colour, add 4 googly eyes and put them into zip lock bags and mailed them to my nephews and some of my daughter’s friends with our Christmas cards. I might just send them the printed pages instead next year. I always love sending something special with my cards for the kids to do or have for Christmas (i.e . Jesus is the reason for the season stickers, etc). it’s simple idea but we can create the pictures according the age of our students with many kinds of materials… thank you.